The most anticipated fight of the year so far has arrived. This Saturday will see 3 of the world championship belts go on the line as two undefeated heavyweights go toe to toe in the ring. Anthony Joshua holds the WBO and IBF belts with a record of 20 fights, 20 wins and 20 KOs. His opponent, Joseph Parker, holds the WBO title with a record of 24 fights, 24 wins and 18 KOs. The records and reputations speak for themselves as two big hitters put their belts and ‘O’s on the line. The other belt is held by Deontay Wilder who was supposed to be ringside working with Skysports but he seems to have pulled out which will only decrease his chances of a shot at Anthony Joshua. The brash American holds the WBC belt and on paper the most impressive record of 40 fights, 40 wins and 39 KOs. He will be hoping to land a fight with the winner to unify the division with the last undisputed heavyweight champion being Lennox Lewis in 1999. Anthony Joshua is the favourite going into the fight after his rapid rise through the ranks has seen him become the golden boy of boxing. The Olympic champion now holds two World Championship belts and is on a mission to dominate the heavyweight division. There was some disappointment with his last performance against Takam but I think that can be forgiven as all his training was geared towards a completely different fighter in Pulev. Before that Joshua had come from the brink against Klitschko, one of the greatest champions of all time, to win in spectacular fashion and also showed good recovery against Dillian Whyte after being caught in the early rounds. Although real courage and heart were shown in these fights, Parker’s camp believe it has highlighted a weakness. 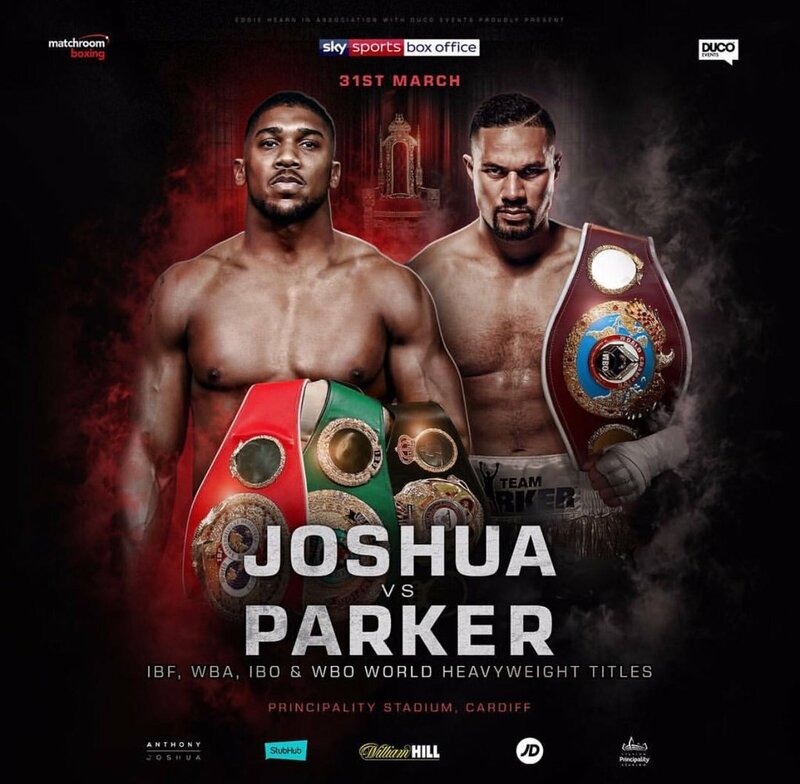 Video’s of Joshua being rocked were the focal point of Team Parker’s early media output as they tried to get under the skin of their opponent. They believe Joshua has a weak chin and Parker has the tools to exploit it. The focus seems be on speed, power and footwork to enable Parker to derail the champion elect. That’s easier said than done but Parker has shown he has power and can take a punch. Whether his chin is tough enough to withstand 12 rounds with Joshua is another question. The Kiwi last fought in the UK against Hughie Fury which was one of the worst fights I’d seen in a long time. Granted that was mainly down to Fury’s style but Parker did very little to impress me that night. He has since had surgery to fix a long standing elbow issue which has apparently increased his overall power and not surprisingly his team are saying he is in the best shape of his career. Either way someone is losing their unbeaten record and I see Anthony Joshua coming through this with relative ease. Click here for a run through the star studded undercard. Whether you agree with some of their methods or not Parker and his team have done a very good job of promoting the fight. David Higgins has become a bit of a controversial figure in the UK but I think he has done what he wanted to do and got under Joshua’s skin. However, I don’t see this having any impact on the fight as Joshua continues his march on the division and knocks out Parker for the first time in his career.